Our Certified Termite Technicians will install Termite Bait Stations to ensure you have a Termite Free home. Our Termite Technician will install a Trelona Advance Termite Bait System (ATBS), consisting of multiple Termite Bait Stations to eliminate Termites from your property. Give Us A Call Today. 1-844-305-8999. Subterranean termites are social insects that nest in underground colonies. There can be millions of termites in a colony, but you may never notice any evidence of them until you see them swarming or discover the serious damage they have caused to your home. In fact, termites cause more than $5 billion worth of damage each year in the U.S. alone – damage not covered by most homeowner’s insurance. 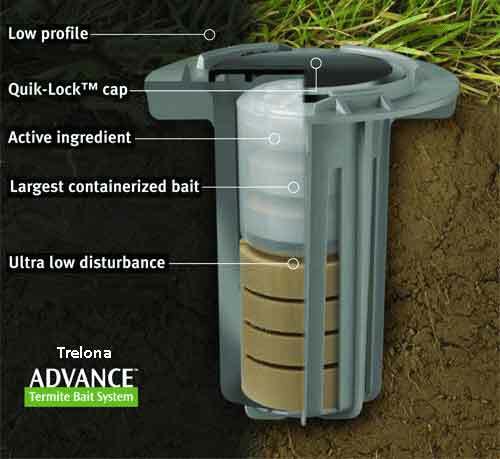 The Trelona Advance Termite Bait System. Waiting until termites strike to take action in getting rid of them is one of the biggest termite control mistakes a homeowner can make. Your home is simply too important, and the potential damages are too great for a cross-your-fingers-and-wait strategy when it comes to termites. Advance Termite Monitoring watches over your home 24 hours a day and allows our certified service technicians to check the Termite Bait Stations regularly to ensure there are no signs of termites present. 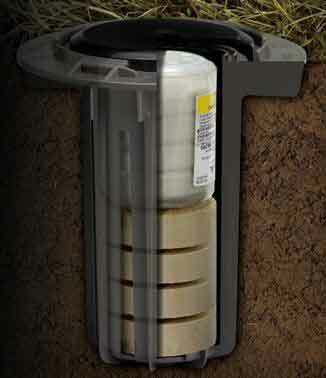 Trelona Advance Termite Bait Stations with termite inspection cartridges are strategically installed around your home. These cartridges contain active-ingredient-free Puri-Cell® monitoring tablets that termites find even more appetizing than wood. If termites decide to invade your home, the Trelona Advance Termite System becomes your first line of defense! 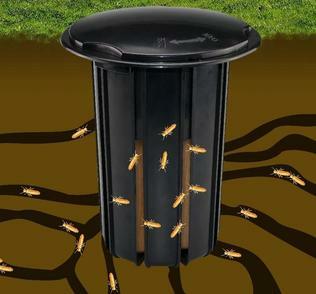 The Advance Termite Bait System is an intelligently designed system, with proven results. This system is a second-generation station based on input from universities and pest professionals. It offers a major advance in termite baiting technology via a dual-stage process that features termite-preferred food sources and an ultra-low disturbance design to pattern termites natural feeding behavior, leading to enhanced colony elimination. The large containerized bait load allows for a large amount of bait to be fed to the colony, in a short amount of time to eliminate termite colonies faster. The Advanced Termite Bait System is also equipped with a proprietary rugged station locking mechanism that helps to keep children and pets out. Termite bait technology has been extensively researched by leading university researchers to demonstrate the effectiveness in eliminating multiple termite colonies. How does the Trelona Advance Termite Bait System work? First, a technician will inspect your home for termites. Thereafter, the Trelona Advance Termite Bait System will be installed in soil around the perimeter of your home. The stations will then be checked regularly for termite activity. When termites are found in a station, the Termite Bait Stations Inspection Cartridge (TIC), containing no active ingredient, is replaced with a Termite Bait Cartridge, containing active ingredient, so the termites can begin feeding on the bait. As termites feed and then travel back to the colony, they share termite bait with their other nest mates. They will then send other termites back to feed on the bait as well. As feeding on the bait continues and more and more termites are affected, the termite colony starts to die and is eventually eliminated. After a colony is eliminated, the bait is replaced with a new inspection cartridge. Dependable Exterminating will continue to inspect the Termite Bait Stations on a regular basis. This is done in order to discover and treat any new colonies that might try to invade your property. Give Us A Call Today. 1-844-305-8999.